At the NYT City Room blog today, David Dunlap writes about the dismantling of all but the lowest portion of La Guardia Airport’s 1964 air control tower. As he notes, “Loved or hated, the old control tower was undeniably a traveler’s milestone.” When I grew up, and more so during the years that I lived in Boston, I flew into and out of La Guardia countless times. Less frequently since moving to Seattle, but still we pass through La Guardia on occasion, and indeed, the old control tower had come to be as distinctive a structure as any in New York. I am sad to realize it has disappeared. We drove by La Guardia twice over Labor Day weekend, heading back and forth between JFK and Manhattan. I’m surprised I failed to notice the tower’s absence. There’s not a whole lot to like about La Guardia. Now it is missing my three favorite features: the tower, the rusted frame of the parking garage, and the temporary building that was home to the Eastern Shuttle. The garage was left unfinished in order to develop a patina — at least that was my understanding — and after decades of what looked like neglect, it was finally painted over. As for the shuttle, that amazing service in which you lined up to fly to Boston or DC and boarded whichever plane showed up next, rather than a terminal, La Guardia had an over-sized shack you would pass through on the way to covered passageways with openings to head out to board the planes. No reservations, no tickets, no boarding passes. Just get on, and if the scheduled hourly flight filled up, they’d start filling another. Once the plane (one of a fleet of DC-9s) was in the air, the flight attendants would come down the aisle to take payment. On the Boston end, one would arrive at a regular terminal, Logan’s Eastern Air Lines terminal, pleasant enough, but without the charming seediness of La Guardia. 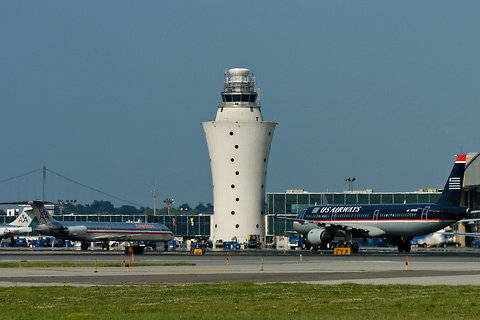 Alas, Eastern went downhill, then out of business, Delta and US Air took over shuttle service, the old shuttle shack was replaced by US Air’s and Delta’s new terminals, and before long, the iconic tower was the lone representative of my beloved trio. Now they’re all gone. from the cabin of a Lockheed Electra or a Boeing 727 meant you were really back in New York. No other airport had anything quite like this porthole-pocked cynosure; a hometown creation by Wallace K. Harrison, the consummate New York establishment architect of the mid-20th century, who designed the Trylon and Perisphere for the 1939 World’s Fair and went on to play an important role in Rockefeller Center, Lincoln Center and the United Nations.